It’s really great when you find a boat that offers both power and performance. 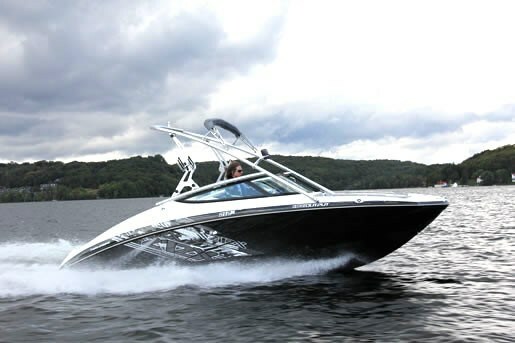 Throw in an eye-catching design with a slick graphics package and you’ve got Yamaha’s 2012 212X Sport Boat. The 212 Series features two models the “X” and the “SS”, each with slightly different features. The 212X is the watersports specific version and is most easily recognized by it’s solid no nonsense wakeboard tower. The tower is fully collapsible, includes swiveling board racks on both sides, and is very well integrated into the overall design of the boat. The 212X is purposefully designed with the watersports enthusiast in mind. 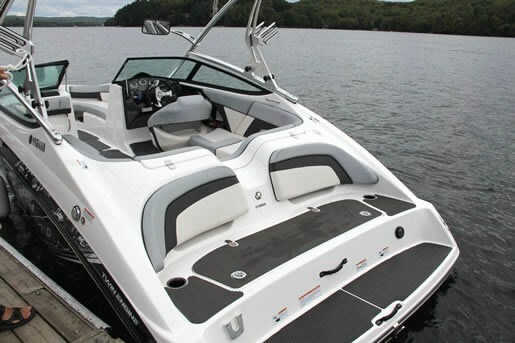 Yamaha’s signature stern lounge and swim platform is as functional as it is comfortable and provides ample room for gearing up for a wakeboarding or waterskiing session. Featuring a two-tiered design complete with padded backrests, stereo remote control, Hydro turf mat, cup holders, re-boarding ladder, wet storage compartment and even a mount for the 212’s dinette table. It’s also the perfect spot to simply lounge about and soak up some sun. This 21’ foot boat is powered by twin Yamaha 1812cc, four-stroke, four-cylinder High Output engines, and when you put the throttle down you’re instantly aware of the power that this boat possesses. These engines reward you with 0-48 km/h (0-30 mph) acceleration in 4 seconds and a top speed of 90 km/h (56 mph). 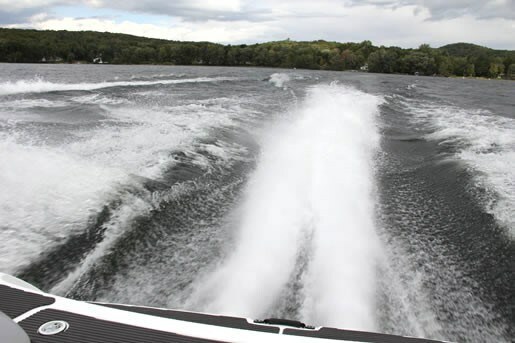 In a 21’ footer, not only is that speed noticeable, it’s downright exhilarating! Moving further into the cockpit of this craft you’ll find a very comfortable wrap around “J” seat layout, which is definitely a luxury not always found in a boat this size. There is the usual storage under both the port and starboard seats, with the 212X featuring ballast sacks capable of 750 lbs. Also located on the port side is another mount for the pedestal table. The abundance of storage space continues with the oversized in-floor locker located in the deck between the two consoles, perfect for storing skis and boards. Positioned at the helm is a fully adjustable wrap around bucket seat with a flip up bolster. The helm has been designed by the GK Design Group in Japan, which designs all of the Yamaha street bikes. It is an attractive blend of form and function dominated by 3 large gauges (two tachometers flanking a center speedometer). Both tachometers feature digital gauges that let you access 18 different functions such as water temperature, depth, multiple fuel monitoring options and more. 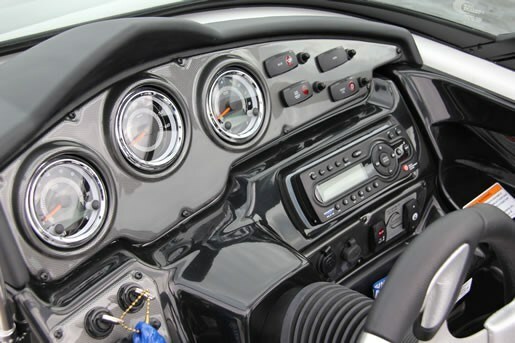 Also located on the helm are the controls for the “Cruise Assist” and “No Wake Mode”. These useful features allow the driver to hold the engines at a specific RPM for towing, cruising, or when low speed running is required. 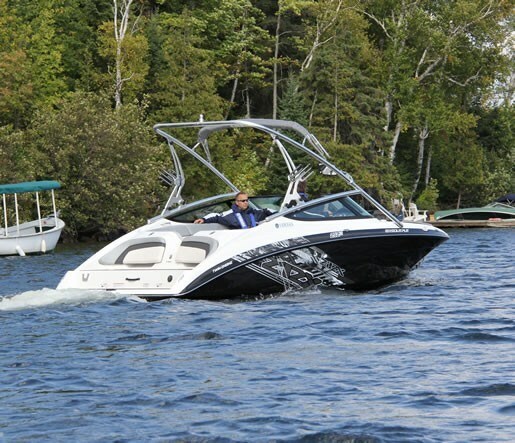 The “Cruise Assist” is adjustable by eight positions up and eight positions down, while the “No Wake Mode” offers three different RPM settings. Another very useful feature that is all new for 2012 is the “TDE” or “Thrust Directional Enhancer”. Controlled by adjusting the throttle, it performed exactly as described, directing the water flow at an optimal angle resulting in very responsive handling as the boat was maneuvered left and right at slow speeds. The bow of the 212X is well designed, with ample storage under the two large lounge seats, which are roomy enough to comfortably seat four adults. However it is the versatility of the bow seating that is most impressive. By re-configuring the seat cushions you can create rumble seats, a sun pad, and a three wide, forward facing seating layout. The designers at Yamaha really put their thinking caps on when they came up with this innovative design. The very front of the bow features a large anchor/ladder locker and is nicely detailed with two speakers and two cup holders. 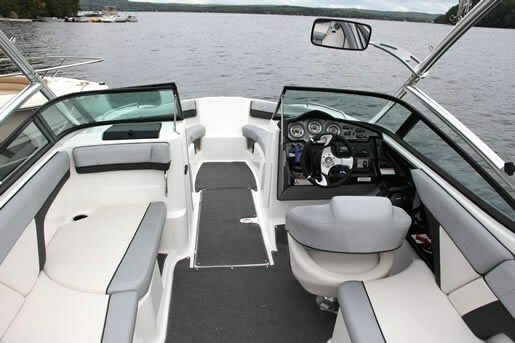 The 2012 Yamaha 212X is a boat that comes loaded with standard features that are often considered optional on many other boats in the same category, including snap-in marine grade carpet, Bimini top, painted trailer with brakes, and more. The 212X is available in Black and Yacht Blue and if you really want to sizzle on the water you can grab the “SS” model of the 212 Series in bright Red.